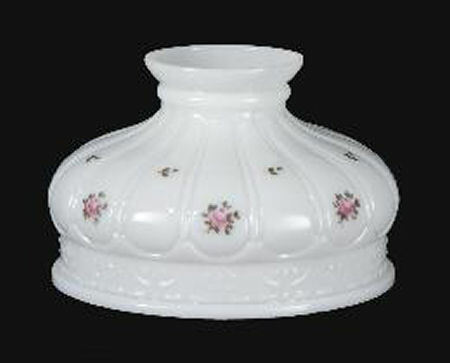 This Early Coleman Style glass shade is a beautiful opal white glass with hand-painted Amish Roses floral design. Quality, hand-blown glass shade is American Made. This shade has a 10" base diameter, which is the standard size for Coleman pressurized table lamps, Aladdin Lamps, and many other Central Draft Coal and Kerosene table lamps. Shade has a 10" bulge and is 6 1/2" tall. This quality glass lamp shade will compliment any table or bedside lamp.